Chicken breast is a popular cut of meat for a number of reasons: it’s usually pretty cheap, incredibly versatile and it’s the leanest cut of the chicken, so you can feel good about serving it to your family and eating it yourself. If you don’t have much experience cooking with chicken breasts, keep these expert kitchen tips handy while you cook. Tip 1: When you are shopping for chicken breasts at the grocery store, you’ll notice they are sold in varying amounts of weight and thickness. When you take them out of the package, each cut may be thicker on one end and thinner on the other. To ensure even cooking, give your chicken breasts a quick pound with a meat mallet for uniform thickness. The easiest way to do this is to put the chicken breast into a gallon-sized plastic bag and pound until the thickness looks even. Tip 2: To safely eat cooked chicken, the internal temperature must be at 165°F. Make sure you have an instant-read thermometer handy and stick it in the thickest part of the chicken to check the temperature before serving. Tip 3: Leftover cooked chicken can be stored in the refrigerator sealed for 3 to 4 days. If you bought raw chicken from the store and don’t intend to cook it right away, throw it in your freezer until you are ready to cook with it. Still not sure what to make with chicken breast? 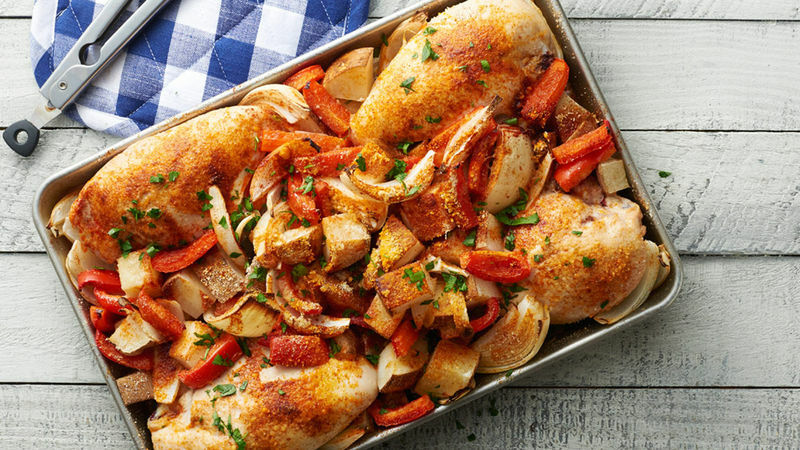 Whether you are using a skillet, the oven or a slow cooker, read our guide to how to cook chicken breast for all the best ideas for things to make with chicken breast and more expert kitchen tips and tricks.